St Matthew’s Westminster, has always been remarkable for its congregation. It would be difficult to name any other church in London in which you might see a prince of the royal house seated next to a collarless (but chokered) parishioner and a cabinet minister side by side with a slum mother. St Matthew’s has become a spiritual home not only to its poor parishioners but also to hundreds of others in all ranks and professions. Conditions, to be sure, have changed in recent years, just as the parish has changed from being an almost impenetrable slum into a more or less wholesome district. The church owes its origin indirectly to William Buckland, the distinguished geologist who became father of the even more distinguished naturalist and was for the last eleven years of his life Dean of Westminster. He had turned sixty when Sir Robert Peel brought him from his geology and mineralogy at Oxford to rule over the Abbey. His wife seems to have been disturbed by the conditions she found prevailing almost under the shadow of the great church. She moved the Dean to interest and action with the result that to the two only churches serving the parochial needs of ‘old’ Westminster were added those of St Mary, Vincent Square, and St Matthew, Great Peter Street. St Matthew’s was finished in I8SI and consecrated in June of the same year. Gilbert Scott was the architect engaged for the work, but there was in his office at the time a young man named Bodley - a circumstance to which may reasonably be attributed the fact that the church is one of the least characteristic of Scott’s efforts. In later years Bodley was directly responsible for many beautiful additions, notably the screen. The site on which the church stands is part of what was known as ‘The Devil’s Acre.’ It was flanked by disreputable public-houses and surrounded by brothels and other houses of evil repute. Looking at the district to-day it is difficult to realise that for a good many years it consisted mainly of a congeries of courts and alleys inhabited by people of the lowest type, with many criminals among them. Even into Great Peter Street the police never ventured alone and seldom at night. There had been one or two efforts to improve the conditions of the people. They usually failed because the humblest attempt at starting a social institution ended, by providing a rendezvous for thieves. In Old Pye Street there was a school-consisting of a single room-for boys and girls, but only a minority of the urchins of the district attended it. There was no lack of devotion and self-sacrifice on the part of Mr Trevelyan and the three friends whom he invited to join him in the work. 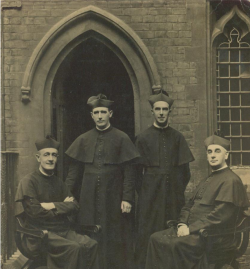 For twelve years the staff consisted of Mr Trevelyan, the Revd W. H. H. Jervois, the Revd R. E. Giraud and the Revd H. E. Simpson. The last named is the sole survivor of that band. He remained at St Matthew’s for twenty-three years. At the time of his appointment Mr Trevelyan was vice-principal of Ely Theological College and his Churchmanship was by no means that of his predecessors. Very wisely, however, he made no immediate changes in the services, but concentrated on visiting and getting to know every family in the parish. That task was beset with the physical difficulty of gaining access to some of the courts and alleys. Its accomplishment was amply repaid by the trust and friendship which the clergy won even from those who were unwilling to attend the church. Without the day schools it is humanly certain that the subsequent life of St Matthew’s could never have been built up. As it was there arose a generation which had been instructed from childhood in the Catholic Faith. Teaching, indeed, was always a prominent part of the work in those days, for both Mr Trevelyan and his staff excelled at imparting instruction whether in courses in church or to individuals. So it has continued. One of the greatest ventures of faith was when this poor parish resolutely determined a few years ago that it would not sacrifice its schools under pressure from the educational authorities. The buildings were out of date and deprived of light and air by new erections. They were on the verge of being condemned when a large building adjoining the Old Pye Street site came into the market. There was no money whatever available :and the price was £6000. None the less the Vicar (the Revd A. E. Cornibeer) and the churchwardens made the plunge. Within two years the site was paid for, and two years later a further £I2,000 had been raised and the present fine schools built. That, at a time when in many parishes schools were being given up, was a courageous action. Mr Trevelyan was Vicar for twenty-three years. He left to become the first Warden of Liddon House, which was founded in I907 to give intellectual help to educated men. It was then in Thurloe Square, but is now conducted in connection with Grosvenor Chapel, South Audley Street. With these aims always in view the clergy have tried to supply services suitable for those to whom the Gospel means little or nothing, and who can only be won by the simplest services and the clearest teaching. Perhaps the greatest figure connected with St Matthew’s was that of Frank Weston, Bishop of Zanzibar. He was for a short time a curate in the parish, and there is an altar and reredos to his memory in the chapel of the Holy Name. He and Mr Atlay had been the outstanding figures of the first great Anglo-Catholic Congress held at the Albert Hall in I920. On the day of his consecration in Westminster Abbey in October, I908, Bishop Weston performed his first episcopal act in St Matthew’s by confirming a young schoolmaster who was going out to join the Universities Mission to Central Africa to which the bishop was to give his life.